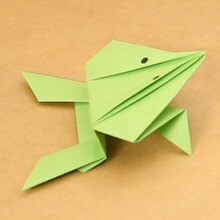 This tutorial will teach you how to make a very funny origami, that will even be able to jump: the frog. It's not that easy but if you watch the video carefuly and read the tutorial, you will surely be able to make it. Fold the sheet of paper diagonally twice and open it again. Join two opposite corners and pull down the two others. You must get an arrow with two folds on each sides. Leave the origami on the table, arrow to the top. Fold the folds of the top toward each other to the bottom, perpendicularly to the bottom side (this is the beginning of the back legs. 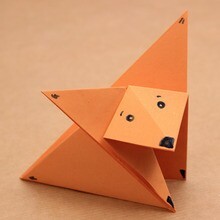 Turn the origami over and this time fold the folds left to the top toward each other (this will be the front legs). Turn over the origami again and to finish the back legs, fold again the folds but to the exterior and creating a new fold. 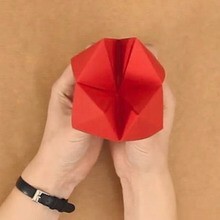 Turn the origami over and fold it horizontally in the middle. Fold the half on the side of the back legs to the horizontal line of the last fold. These two last steps will allow the frog to jump..
To finish the front legs, fold the two pieces of paper left to the sides. Now you just need to turn it over one last time and draw the eyes. To make the frog jump, press its back with one finger. The more thesmaller the origami the farest and the highest the frog will jump. Try to make it jump and fall back up on its legs.